Came across this herb just now whilst looking at Doubles recipes. Could've been a possible candidate for the recent ribbed coriander stems? More than likely would've been a rogue parsley stalk that slipped into the bunch of coriander. I've found that quite common when buying from Indian supermarkets. Shadow beni is a leafy herb native to the West Indies and Central America. 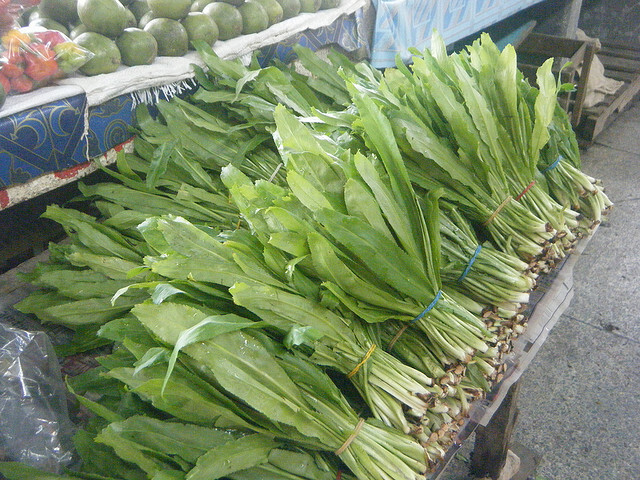 It is widely used in the cuisine of these regions, and it also appears in Asian foods. This herb can sometimes be difficult to obtain outside these regions; sometimes specialty stores will stock it frozen or in cans. If shadow beni is not available, cilantro can be used as a replacement. This herb has a multitude of alternate names, which adds to the confusion for many cooks. Formally, shadow beni is known as Eryngium foetidum, but it is also known by bhandhanya, fitweed, long coriander, false cilantro, culantro, recao, shado beni, sawtooth, spiritweed, ngo gai, ketumbar java, Mexican coriander, donnia, and spiritweed, among many other names. This profusion of alternate titles is especially frustrating for cooks who try to work with ethnic recipes, as many people are unaware of alternate names for the herb. As the name “culantro” suggests, shadow beni tastes very much like cilantro, with a somewhat stronger and more lingering flavor. This flavor is often utilized in marinades and sauces, and the herb is also used as a garnish and to dress various foods. The distinctive pungency is especially popular in Trinidad, where shadow beni is used in traditional salsas and dressings, along with hot sauces. As is the case with cilantro, shadow beni is not to everyone’s taste. The flavor tastes strange to some people, while others find it very enjoyable. As the scientific name indicates, shadow beni can taste almost fetid at times, especially when paired with poor choices of seasoning and spices. However, the flavor is also quite unique, and some foods simply wouldn’t taste the same without shadow beni or cilantro, as people who have attempted to omit these herbs have noticed. In the Caribbean and Southeast Asia, shadow benny is often readily available at produce markets, because it is a commonly used ingredient. Outside of these areas, the herb can be challenging to find, as it is a bit obscure. In regions with an ethnic community, shadow benny can sometimes be obtained at regional grocers, or especially larger markets which cater to the minority community. People can also grow shadow benny at home from seeds or starts; its growth habit is much like that of cilantro, so care is advised in especially warm climates, where the herb may bolt to seed. It is learned that the new me. I do not know that I'm never aware of before. And I promise to use in daily life every day.